Looks amazing. I would love to learn to weave. As a relatively new weaver I was directed to the online guild and what a fantastic find it was! I watched everything within days of joining and learned so much. Now I’m re-listening to each episode as I progress to that level. Some I’ve watched 3 or 4 times. What a wonderful journey it’s become. Thank you so much for sharing with us online, as I could never afford the trip to Salt Spring, even though I wish I could! Jane, Jane, Jane! I am so happy that you started the online guild. I joined at the beginning of the journey and the beginning of my journey into weaving. I look forward to every episode. It is wonderful to be able to go back to an episode if I have a question. Maybe, someday I will be able to afford a trip to Salt Spring Island for a workshop but until that time online it is! Keep up the great work. Thank you for everything you do. Not only do I watch and re-watch episodes but the whole of the guild is a wonderful reference library for any weaver. Sett, finishing, color theory (that in itself is a gold mine of information), looms, yarns, and on and on… WONDERFUL!! I hate when I have finished an episode and I can’t wait for the next one. Jane is one of those people that everyone would like to be her friend! I don’t believe her kindness, gentle spirit and fun way of teaching is just for the camera either. She makes each one of us feel as if we were right there in the studio with her. As long as there is a JST Guild, I will be a member! Been enjoying the guild from the beginning and have been spreading the word here in the uk. So far introduced 6 of my guild and a couple more are interested. Not bad for a small guild. I might apply for a discount if I can make it up to 10 ! I love the on-line Guild! 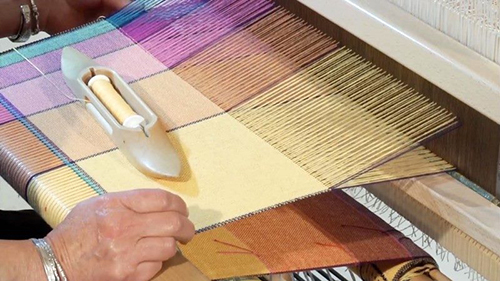 I’ve been weaving for more decades than I care to admit and do belong to a really good Guild in MN, but I still learn something every time you post a new episode. This years Color and Design episodes have really blown my mind. Totally changed my approach to project planning, use of color and experimenting with a long warp. Keep up the good work! Your guild was a gift from the wonderful Joan Sheridan owner of Heritage spinning & weaving. She treated it to me when I bought my Louet Spring. I will forever be great full. I love your guild the best part was that you began at the beginning! Thank you. Jane you are amazing. I have loved being in your workshops and love the online guild too. You are an amazing teacher and inspire us all to reach our highest potential. The workshops allow us to be with you in person which is fabulous – such a sense of humour. But the online guild allows us to see you again and again to jog our memories on the key elements of colour and design. I watch the episodes over and over. That is how I get my “Jane” fix. Thanks for all you do for the weaving world. Jane, I’m so happy you are doing this guild, I have learned so much and made so many lovely things. Your the best!! 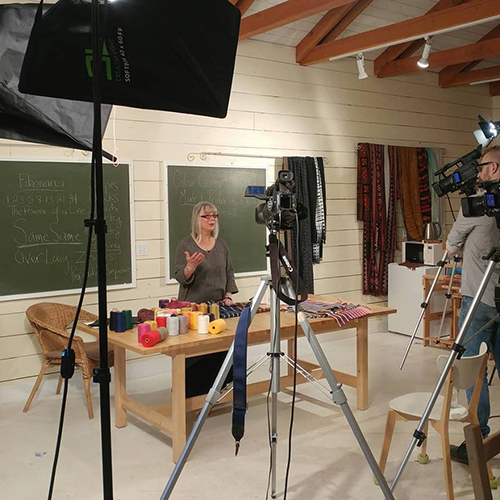 Love love these Jane episodes…I have had the good luck and planning to attend 5 Jane workshops. Now I can relive and review and get inspired again and again.Watched your warping videos today, reminded of proper technique. Thank you so much Jane for all that you do for the weaving community! 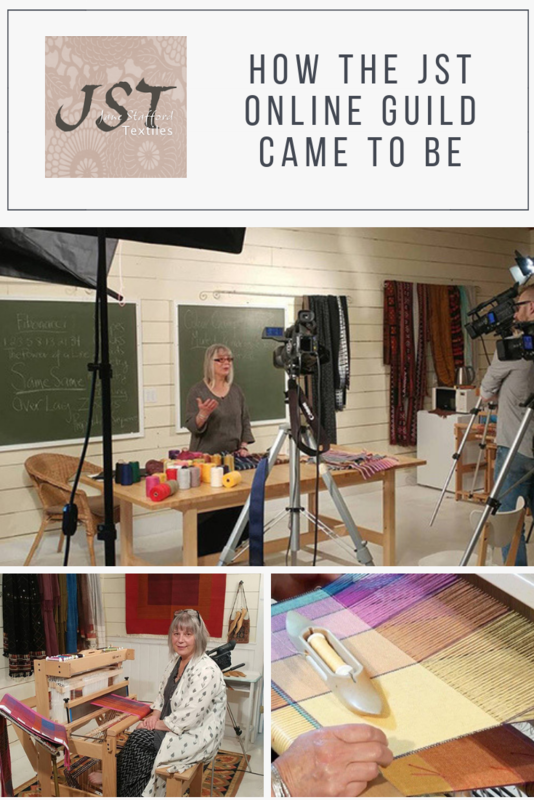 I have been weaving since the early 1990s and I learn something new in each of your episodes!! JST online guild is fabulous! I have had the good fortune to take real time workshops with Jane in the deep murky past but I signed up for the guild anyway, mainly to support her. Even as an experienced weaver, I know I can always learn something new from Jane or be reminded of something I have forgotten. This is a golden opportunity for weavers around the world- new, old or wanna be! Do join the party!!! Diving into an on line class took only a few moments to decide. I was fortunate to take two classes from Jane but then I could never decide what to weave. Both color and design were a struggle. I became a cookbook weaver. Well, has that ever changed! And now I can’t wait to get the next project on the loom. Thanks for being you. I’m having fun with my weaving now. And proud to be able to share it with those I love.